A key ingredient of BACARDÍ rum is molasses, a byproduct of sugarcane. Part of our Company legacy is to protect the environment and incorporate sustainability in all of the places we do business. That extends to the far reaches of Fiji, where we have been helping to raise the standards for sugarcane production. Bacardi and the World Wildlife Fund (WWF) are working together on a three-year project to address challenges and opportunities facing the sugarcane industry in Fiji. The partnership aims to help educate farmers about increasing crop yields while reducing nutrient and soil runoff, as well as other practices that are hazardous to the Great Sea Reef. The goal is to establish suppliers who can produce high quality yields under the metric-based sustainability standards set by Bonsucro. Progress is apparent already on farms and mills in Labasa, a town on the island of Vanua Levu. Yet, initial results show more work is needed to achieve formal, sustainability certification. A gap analysis from the Fair Trade Standard points out difficulties: a lack of record keeping from farmers – and delays from the Fiji Sugar Corporation. To remedy this, WWF is planning to set baselines with both groups and is providing Bacardi with updates. The approach is in cooperation with the Fiji Sugar Cane Industry Strategic Plan for 2013-2022, which spells out Better Management Practices. This will ensure that the industry prepares for upcoming challenges and market transformations. Bacardi has broadened the scope of a small sourcing and community project in Ghana, Africa. The aim is to increase the sustainable supply of aromatic, spice plants known as “grains of paradise,” used in the production of BOMBAY SAPPHIRE – while supporting the community where the plants are grown. Our Global Operations team is working with Herbs International Service, the global non-profit organization, AIESEC, and the Ghanaian farming community. Areas of focus include: farming practices that improve productivity and long-term supply, opportunities for students and young people, adult education to maintain farming continuity, as well as health and welfare enhancements in the village at large. We see this project as a template for future community botanicals projects. 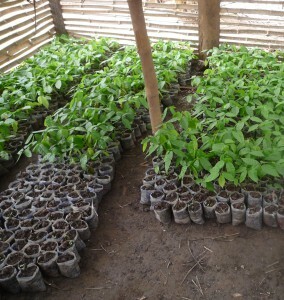 Developing a robust crop nursery is one of the keys to success for our Grains of Paradise botanicals project. 1) Conservation of the Great Sea Reef based on improved water quality from soil runoff. 2) Improved local livelihoods of farmers and communities. 3) Bonsucro certification achieved for farm and mill areas in Labasa, a town in the northeastern part of the island of Vanua Levu. Bacardi and WWF Pacific through WWF US have partnered to address the multiple challenges and opportunities facing the local sugar industry. The project envisions a long-term partnership to help the Fiji Sugar Industry achieve Bonsucro certification and protect the Great Sea Reef from runoffs from sugarcane farming emanating from current practices that need to be changed. There are measures that have been put into perspective to address issues of pollution and nutrient/ sediment runoff into the river system and to the ocean. These measures that have been identified do not compromise grower/miller profitability and yield – and adopt a comprehensive approach for the survival of the sugar industry. The approach is in tandem with the Sugar Cane Industry Strategic Plan 2013-2022, that encapsulates the components of Better Management Practices (BMPs). This will ensure that the industry prepares itself for the future challenges and market transformations. WWF has undertaken an initial exercise comparing the data available to achieve Bonsucro certification in the Labasa sugarcane production area. The initial results demonstrate a significant amount of improvement needed in order to achieve certification. The work was done through a gap analyses with the Fair Trade Standard and much of the transformation will rely on changing the industry’s culture, especially in reference to farmers’ record keeping and performance. The assessment is not a full review of the mill and farmer performance. The two primary obstacles to completing a full pre-audit assessment – farmers do not keep detailed records and engagement with the Fiji Sugar Corporation has been delayed due to a variety of reasons. Therefore a full mill performance audit has been completed. To remedy this situation, WWF has signed a Memorandum of Understanding with the Labasa Cane Producers Association to better engage with farmers to set a performance baseline. WWF is also developing a plan to re-engage with the Fiji Sugar Corporation and to work with the Fiji Research and Development Corporation to set this performance baseline. In spite of the incomplete nature of the gap analysis the initial work identifies key areas where Labasa complies with and does not comply with the Bonsucro production standard. The overall outcome of compliance and highlights of the assessment are detailed below. WWF supplied Bacardi with a full report on the gap analysis and the next steps and this forms part of the ongoing project program.